My schedule was rather busy since we came back from New Year holiday. I hosted one week-long event at work, Enrique left to Stockholm, I attended another week-long event in Bangkok, while preparing for MWC and another trip which popped up in February out of the blue. Still, I wanted to drop this post, as I am super excited to tell you all about our pick for 2016's long vacation! Miami is a magic city covered in pastel hues. From the sunsets through the baywatch huts down to art-decó buildings, up to the skyscrapers and along the Wynwood walls. It is a colorful, fun, artsy, blessed with great weather and latino-caribbean influences. Given the amount of long-haul flights landing here, it is a perfect base to start a holiday in the Caribbean, if you are like me and love the balance between cities and islands - Singapore and Boracay, Bangkok and Koh Samui, Seoul and Hawaii, are some examples of this blend I consider the perfect vacation. Anytime. Avoid April - October as it gets humid in May and then, it comes the hurricane season. 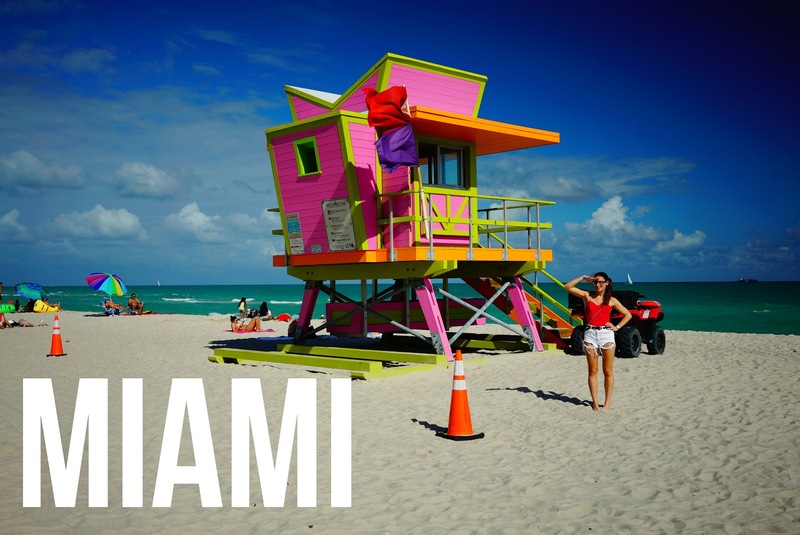 The first five nights, we stayed at a private apartment managed by Miami Beach International Hostel [WEB]. Extremely good location in South Beach - we had great breakfasts at DULCE Café and sushi stravaganza at the nearby Iron Sushi for dinner. Really ample apartment, new and clean. The last night, we stayed at Nautilus, a SIXTY hotel [WEB], also in South Beach. The concept offered by SIXTY is really interesting, a collective of five boutique luxury hotels in New York City, Los Angeles and Miami. Artful experiences within sophisticated backdrops that seasoned travelers will find home. We spent a total of 5 days in Miami, 4 days on the way into the Caribbean and 1 day on the way back to Europe. I think that's more than enough to get a taste of the city. Renting a car is a good idea, at least for a couple of days, as the distances are long so Uber becomes more expensive than rental. Parking is not so straightforward though and rental cars are scarce, plan in advance. You can explore South Beach by foot and take an occasional Uber to a party in the city - see larger map here. We walked all the way North through the Art-Decó architecture jungle that makes South Beach a unique show, make sure you cross through the Bass Museum of Art, which is really worth it. Once we hit the Fontainebleau, featured in Brian de Palma's classic Scarface, we walked back along South beach and ended the day with some shopping around Collins Ave (street 6-8) - check Victoria's Secret and DASH, the multi-brand store owned by the Kardashian Klan. After picking up the rental car - there's a fun story behind how we ended up on a BMW 640i - we admired the colorful murals, cool stores and kistch galleries around Wynwood, the artsy heart of Miami. Drive a bit North and park close to the Bayside marketplace - plenty of parking, to explore some of the most iconic buildings in town. Time for Cuban heritage in Calle Ocho, the heart of Little Havana, where the Cuban community of Miami gravitates around. After, we dropped by Coral Gables, my cousin's hood - blend between Desperate Housewives with The Fresh Prince - and finished with some dinner at Coconut Grove, a shopping district nearby - park at Cocowalk, the heart of it. Besides shooting 1000 videos while driving the convertable over the bridge, we explored Vizcaya Mansion, a villa that could have well inspired the photography on The Great Gastby - see the post to understand why. Come early as we arrived at 11 and waited 45min to get in. Then it was Key Biscayne time, the island where you can explore bits of American history, in a place where people like you and me actually spend their weekends, between sports and barbecue. We took a detour, to check out the fancy stores around the Design District - several blocks North of Wynwood - just to spend some time before returning the car. The third night, we discovered Miami Vice. As a huge Nicki Minaj fan, I knew she was performing on NYE in this club in Miami. But we already had booked flights to spend NYE in San Juan, and the 340$ entrance fee was a bit too much - even for a talifan like me. We agreed that, if Nicki is going, then it must be good right? And it was, but not as I expected - turns out E11even is open 24x7, yes it is a club, more precisely a strip-club where I have seen some of the best pole performers EVER climbing a 5m high bar, doing all kinds of acrobatic tricks and ending up with some dance while customers rain notes on them. Once these 2 girls are finished, a guy in suit collects the notes into some metal bucket, a new pair comes and it keeps rolling. Not what I expected, but hey definitely an interesting part of the local culture - if you ever tried pole dancing as a sport, you will certainly appreciate the difficulty of the show much more. The Venetian Pool is the only pool listed in the National Register of Historic Places. It opened in 1924 as "Venetian Casino" which was created from an old coral rock quarry abandoned in 1921 on 4 acres (16,000 m2). The pool was founded by George Merrick as part of the development of Coral Gables, which was created in Mediterranean Revival style and utilized a large amount of coral for ornamental features of the community. We were truly unlucky to arrive after a 25$ Uber, just to discover it is temporarily closed during winter season (Dec-Feb) for renovation. So we walked all the way to Coconut Grove, had some lunch and head back to South Beach, for movies at Lincoln Road mall followed by dinner at our usual, Iron sushi. After all these years abroad, we can't really watch dubbed anything anymore - just feels silly. Going to the cinema is something special, particularly because since back in Spain, we are apart from each other 6-9 months per year. After the shooting at Fort Lauderdale, it took much longer than expected to make it through the airport on the way back from Puerto Rico, so our last night became a lovely dinner at Nautilus Hotel - super cool if you can afford it, and if you cannot it's OK to book that last night there. We had the morning before heading for our afternoon flight, so we registered for a tour in the Everglades - we recommend to do some research online, as depending on how many intermediaries are involved you may pay anything between 30$ to 70$ for a bus ride, a boat ride and some alligator. Bit of tourist trap, but cool ride around the mangrove.